Paul Allen, the billionaire business magnate who co-founded Microsoft alongside Bill Gates, has unveiled the world’s biggest plane. 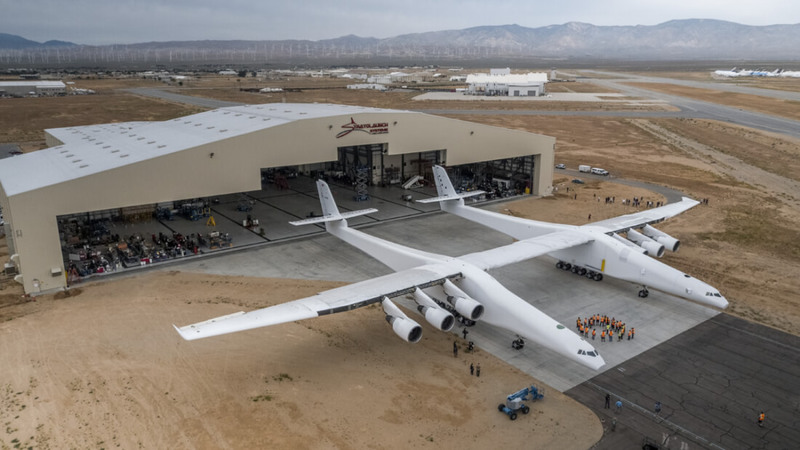 His satellite launch company, Stratolaunch Systems, announced the 28-wheeled aircraft has now had its scaffolding removed, left the hanger, and is about to undergo fuel tests. The double-fuselage plane weighs 500,000 pounds unfueled, but its total weight can go as high as 1.3 million pounds when fueled and carrying a rocket and payload. With six Boeing 747 engines and a 385-foot (117m) wingspan, the plane is so enormous it required special construction permits just for the scaffolding. The aircraft, also named the Stratolaunch, is 238-feet (72m) long, has a tail height of 50 feet (15m), and boasts an operational range of 2,000 nautical miles. It’s larger than Howard Hughes’ “Spruce Goose,” which had a 320-foot (97.5m) wingspan. The plane was supposed to cost $300 million, but there’s no word on whether it exceeded its budget. The Stratolaunch is designed for launching rocket-mounted satellites into space while in low-Earth orbit. Compared to sending satellites into space using traditional vertical rockets, this “air launch” method is cheaper and more effective. "Over the coming weeks and months, we'll be actively conducting ground and flightline testing at the Mojave Air and Space Port. This is a first-of-its-kind aircraft, so we're going to be diligent throughout testing and continue to prioritize the safety of our pilots, crew and staff," said Jean Floyd, Chief Executive Officer of Stratolaunch Systems. This isn’t Allen’s first venture into space. His SpaceShipOne craft completed the first manned private spaceflight in 2004, winning the $10 million Ansari X Prize that same year.